Ultra High Performance Concrete, UHPC, is a new basic material whose limits of application are as yet unknown. As consultants, we develop together with you your new product made of Ultra High Performance Concrete -UHPC. We work in any field of machinery business, not only in the machine tool industry. We know prices as well as the market and we work worldwide. We are prepared to enter into non-disclosure and confidentiality agreements to protect your ideas. Don´t bother me with new ideas, I´ve got a battle to fight! Dyckerhoff GmbH delivers the binder NANODUR® Compound 5941 directly to you. Depending on local available aggregates, durcrete designs the concrete recipe in collaboration with Dyckerhoff and your experts. We provide you with information on suitable manufacturers of concrete production machinery and equipment. 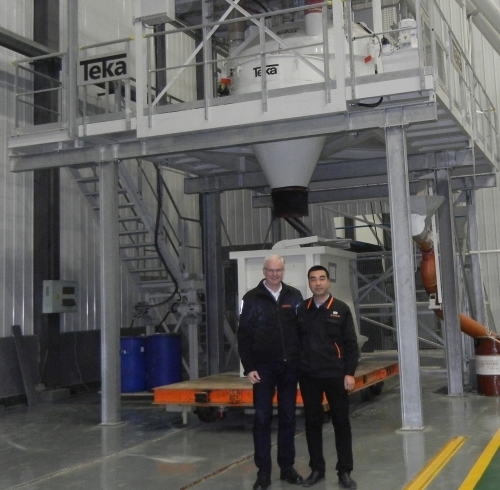 If required, durcrete will coordinate the installation of your own production. We assist you in the start–up phase with clearing up application-specific questions and work out quality assurance schemes. We perform 3D-analyses with the FEM-Program ANSYS. We are experts for structural calculations (bearing capacity) as well as dynamic analyses and thermal conductivity (linear heat transfer). We connect with design, construction and engineering offices specialized for the cementitious mineral cast made of Ultra High Performance Concrete UHPC. If you prefer to keep your knowledge in-house, machine manufacturers are supported by durcrete with consultation and technical data so that the engineering department can come up with quick results. Analyses is linear elastic and so fast and reliable. Every new material will involve patents and, in particular, patent applications. Although the legal provisions do not allow us to provide patent consultation, we will be pleased to furnish you with the numbers of the patents and the patent applications that are known to us. Please take particular note of the patents and patent applications from the Homag Group. The durcrete GmbH has to this day never been confronted with patent violations. The design of the binder is protected by a patent of Dyckerhoff AG. The standard mix designs recommended by us, to the best of our knowledge, do not interfere with the rights of third parties and have never been contested. The high strength grouting compound durfill and the NANODUR® UHPC are specially developped and designed for the machine industry. They have special characteristics and are not according to the specifications given in EN 206 / DIN 1045 and the DAfStb-Guide-Line for grout. So it is not possible to use them in architectural and civil engineering without further approvals by the authorities.